Looking for a gift that will win her heart? 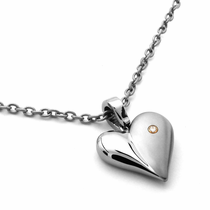 Look no further than Edward Mirell Hearts Collection jewelry. This distinctive line of jewelry shows the strength of your love with one simple yet memorable gesture. 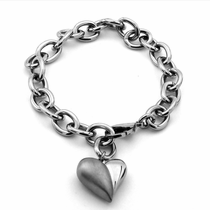 Each necklace or bracelet is adorned with a beautiful titanium heart pendant. 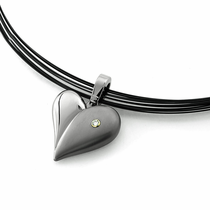 This silver and black heart jewelry line all fits the same theme of love, but each piece has a unique look that makes it stand out. Whether it’s rainbow gems, an inlaid diamond or a beautifully delicate chain, every item in the Edward Mirell Hearts Collection has a look that will make her feel special. If you’re looking for a great gift to give to a special woman in your life, order one of these titanium heart pendant necklaces from Titanium Jewelry. The titanium is durable, lightweight and hypoallergenic, so it’s a style that any woman will appreciate. Plus, our prices are affordable and you’ll even get a 5 year warranty with your purchase. 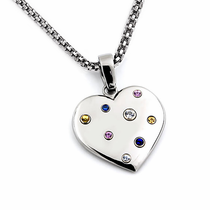 Customer rating for Edward Mirell Hearts Collection by Titanium Jewelry: 5 of 5 based on 20 customer reviews.